Cyclooxygenase-2 (COX-2) is the inducible isoform of the enzymes that initiate prostaglandin synthesis from arachidonic acid. While COX-2 is generally not expressed in most unperturbed adult tissues, it can be induced by multiple stimuli, including growth factors, cytokines, ultraviolet (UV) irradiation, tumor promoters and other stressors. Induction most often involves transcriptional activation of the COX-2 gene via transcription factor binding to cis-acting elements in its promoter. COX-2 is overexpressed in many epithelial cancers including most human and mouse squamous cell carcinomas (SCCs). Mouse skin carcinogenesis models have been extensively used to study the molecular events involved in SCC development. 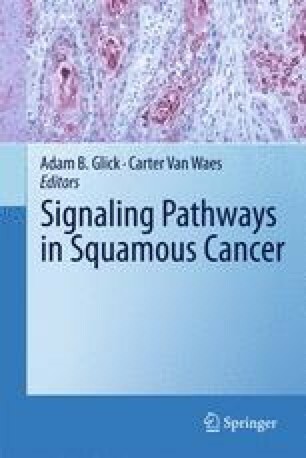 Inhibition of COX-2 activity with pharmacological agents, as well as genetic manipulation of COX-2 expression levels with transgenic and knockout mice, have demonstrated that up-regulated COX-2 expression/activity during tumor promotion is critically important for the development of mouse skin tumors and SCCs using both chemical and UV carcinogenesis protocols. PGE2, a major product of COX-2 in epithelial tissues, signals through four G protein-coupled receptors, EP1-EP4, which show differential affinities for PGE2 and couple to different G proteins and downstream signaling pathways. EP1, EP2, and/or EP4 have been shown to be involved in UV and chemical induction of mouse skin tumors, keratinocyte proliferation, epidermal hyperplasia, inflammation and angiogenesis. We apologize to all those researchers whose important work might not have been acknowledged due to editorial constraints. This work was supported by the following grants from NIH: CA100140, ES07784 and CA16672.